S & J Mobile Tyre Service operate out of Campbellfield, Victoria however our 24/7 on-site truck tyre service means you can have a fully equipped state of the art service vehicle attend to you with all the same benefits you receive in our shop. That's quality, without compromise. Wether you're broken down on the side of a busy highway with a flat truck tyre needing repairs or simply don't have the time to make it into our store; our professional team will make sure to put your wheels in motion again. There's no need to be an existing customer either, we pride ourselves in offering the same service to all of our valued customers. 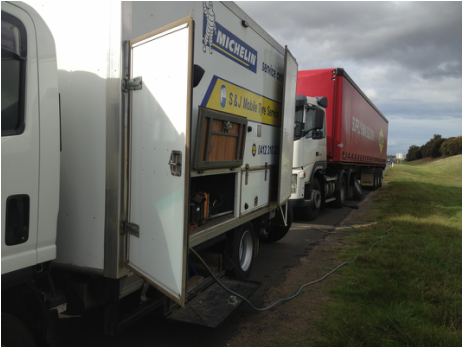 Providing on site truck tyre fitting, repairs and truck tyre breakdown services to over 100 locations Victoria wide. S & J Mobile Tyre's Breakdown Service in action on the Western Freeway.